UK Release Date - 20th July 1987. US Release Date - 30th September 1987. Producer - Def Leppard (Tracks 02/05). UK Record Label - Bludgeon Riffola/Phonogram. US Record Label - Mercury/Polygram. Special Formats - Numbered Limited Edition (3000 copies) CD single. First ever CD single release (LEPCD1). Special Formats - Limited Edition 12 Inch Coloured Red Vinyl. The first UK single from 'Hysteria' was released in July 1987. 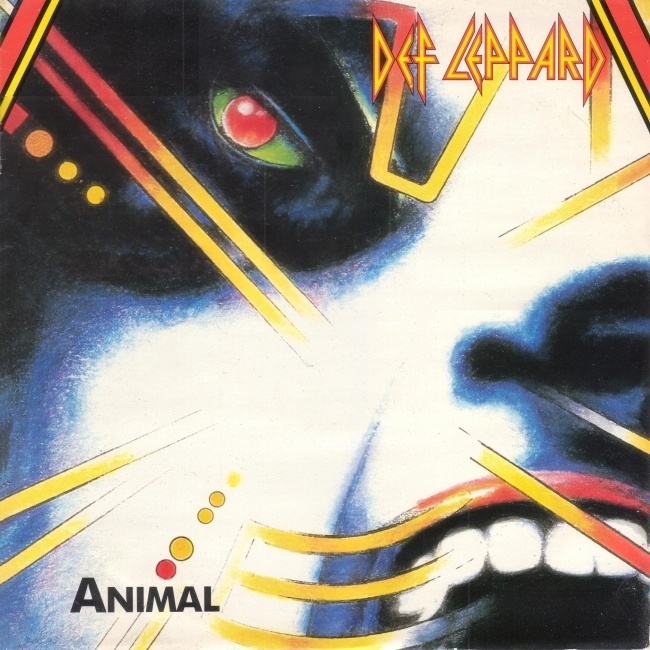 'Animal' was released in the UK as the lead track from the album and it became their biggest hit to date and first ever Top 10 single. In total it spent eight weeks in the UK Top 40, taking four weeks to climb up to number 6 after heavy radio airplay and TV appearances. It was still inside the Top 40 when PSSOM entered. The first of six Top 30 singles from the album in the UK - 5 of them Top 20. Released as the second single in the US it reached number 19. The UK had various formats for the single including the first ever Def Leppard CD Single. The CD was called LEPCD1 and limited to either 1,000 or 3,000 numbered copies. The black left side of the sleeve read "Limited Edition C.D. Single". It included both the single and Extended Versions and a new track 'Tear It Down'. The US single 'Women' was also included. It's inclusion before the album release may explain why the single was so limited in number. It is the rarest and most collectable Def Leppard commercial CD single. Another UK first was the cassette single with the same tracklisting as the 12" version and a 12" Limited Edition red vinyl. International releases included future UK B-Side 'I Wanna Be Your Hero'.